Now updated and expanded to cover the latest technologies, this full-color text on clinical refraction uses an easy-to-read format to give optometry students and practitioners all the important information they need. Also covers a wide range of other aspects of the eye exam, including anterior and posterior segment evaluations, contact lens, ocular pharmacology, and visual field analysis. Four new chapters cover wavefront-guided refraction, optical correction with refractive surgeries, prosthetic devices, and patients with ocular pathology. Offer precise, step-by-step how-to's for performing all of the most effective refractive techniques. Presents individualized refractive approaches for the full range of patients, including special patient populations. Contriubtors are internationally recognized, leading authorities in the field. New full-color design with full-color images throughout. Completely updated and expanded to include current technologies. A new chapter on Optical Correction with Refractive Surgeries, including keratoplasty, traditional refractive surgeries (e.g. LASIK and PRK), crystalline lens extraction with and without pseudophakia, the new presbyopic surgery, etc. A new chapter on Wavefront Guided Refraction provides information on the advantages and limitations the Hartmann-Shack Method for objective refraction plus aberrometry and the refraction and the use of in the correction of the eye with spectacles, contact lenses, and refractive surgery. A new chapter on Patients with Ocular Pathology reflects the most current knowledge of patients with ocular pathologies. Provides information on Optical Correction with Prosthetic Devices, including corneal onlays, stromal implants, phakic intraocular lenses, etc. Includes new chapters and/or discussions on such topics as: Aberrations of the Eye, Refractive Consequences of Eye Pathology, Diagnosis and Treatment of Dry Eye, Diagnosis of Pathology of the Anterior Segment, Diagnosis of Glaucoma, and Diagnosis of Pathology of the Posterior Segment. Visual Acuity chapter expanded to include the effect of refractive error on visual acuity and statistics on how much of a change in visual acuity is significant. Objective Refraction, Corneal Topography, and Visual Field Analysis chapters include the addition of new electro-optical and computer techniques and equipment. Chapters on Multifocal Spectacle Lenses and Contact Lenses now cover newer progressive addition lenses and contact lenses that are now on the market. Electrodiagnosis chapter revised to take a more clinical approach. 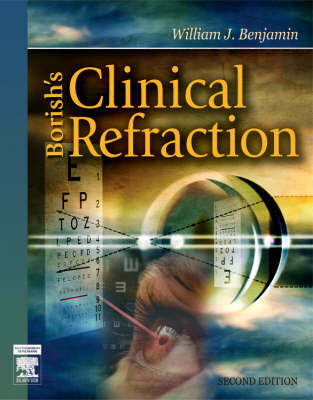 and introduce Borish's Clinical Refraction, Second Edition.